When you’re shopping for a new, used or Certified Pre-Owned Toyota, you need to be able to trust the dealership that you’re doing business with. For this reason, the professionals at our Toyota dealership in Hollywood, FL, make it a priority to get to know you so they can match you with the Toyota that best suits your personality and lifestyle. We’ve been in business since 1981, and in that time, have learned what it is people love about Toyota vehicles. We have over 100 experienced sales associates who know our models inside and out. These individuals look forward to getting to know you, your needs, and your budget to help you pick out the perfect new or used Toyota for you and your family. When you visit Toyota of Hollywood FL, you’ll find that we have one of the biggest inventories in the state. Whether you’re looking for a new Toyota Prius or a pre-owned Toyota RAV4, you’ll be sure to find it here. We can provide you with the model, style and color that you want, and if we don’t have it we’ll help you find it at no additional cost! A new vehicle is an investment that will last you for many years, so we want you to be confident that you’re getting exactly what you want. Stop by our Toyota dealership for a test-drive and to talk with one of our sales associates today! 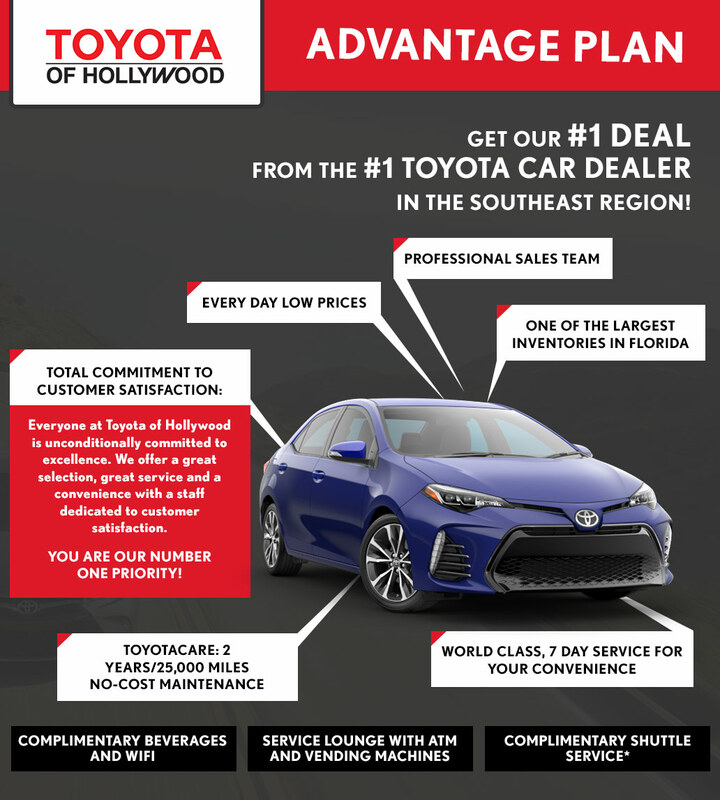 Looking for More Reasons as to Why You Should Buy from Toyota of Hollywood FL? We offer everyday low prices. When you visit our dealership, you can be confident that you’re getting a fair price. Whether you need routine Toyota service and maintenance or emergency repairs, our Toyota service center offers flexible hours to accommodate your busy lifestyle. We’re open seven days a week, so you can schedule a service appointment any time! If you buy a new Toyota from us you can take advantage of ToyotaCare – a 2-year/25,000-mile no-cost maintenance plan. Save on normal factory-scheduled service for the first two years after your purchase. At our Toyota dealership, you are our number one priority. We’re completely committed to excellence and customer satisfaction. If there’s anything we can do to make your visit with us more enjoyable, please let us know! If you drop your car off for service, enjoy complimentary Wi-Fi and coffee in our lounge. If your Toyota requires service and you’d like to continue on with your day, you can either enjoy our complimentary shuttle or make an appointment to pick up a complimentary rental vehicle. We offer a limited 30-day return policy on all used vehicles, so you can buy with confidence.